The award-winning and bestselling brother and sister team, Amy Goodman (popular and successful host of the TV and radio show Democracy Now!) and David Goodman (an investigative journalist), authors of Static and Exception to the Rulers, return with Standing Up to the Madness. 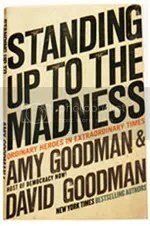 The Goodmans strike out on a new path in aiming to not retread on the familiar ground of endlessly criticizing the Bush administration and its endeavors, but to report and record grassroots stories of people from across the country who have suffered under the current regime, and how they have fought back and gained some ground. The stories in the book are grouped into subjects on how science is being threatened, schools and education being threatened, the war in Iraq, and simply “Standing up to the Madness.” There is the story of Malik Rahim, a native of New Orleans who was there when Hurricane Katrina struck, and is still there now trying to rebuild the ravaged country and its torn and exiled people. Rahim tells of the little help he has seen from the government, and what there remains now. He also provides startling insights into the horrific acts of racism that are now commonplace in the ruins of the city. But Rahim has started a charity group from scratch, Common Ground, that is now strong and increasing in size and popularity, providing aid and shelter to the many citizens of New Orleans that still have nowhere to call home. Raed Jarrar, a US citizen originally from Iraq, tells the story of his being prevented from flying on JetBlue because he was wearing a T-shirt that read “We Will Not Be Silent” in both English and Arabic. Clearly it was because of the color of his skin, and with help from the original manufacturers of the T-shirt, he was able to make a stand for freedom of speech. Librarians across the country tell their story of standing against the Patriot Act and its supposed allowance of turning over library members reading histories. Psychologists speak out against the use of their members being used as litmus tests and decision makers when witnessing torture at Guantanamo Bay. American soldiers back from Iraq tell the true story of what was really taking place in the Middle East, and why every day is another step in the wrong direction. It is easy to criticize the Bush administration, but the authors of Standing Up to the Madness challenge the reader to do something other than criticize. Through the voices and lives revealed in this book, one can see that change and justice is possible, and with an epilogue of advice and suggestions, it gives one fuel to begin the change that is necessary to make America the land of the free once again. Originally written on July 11th 2008 ©Alex C. Telander. Fareed Zakaria, author of The Future of Freedom, and editor for Newsweek Inter-national, offers up a sobering yet fascinating look at the possible future of the United States and its stake as the global superpower in the first half of the twenty-first century. The Post-American World is part business, part political, part historical, and part sociological; as Zakaria analyzes how the United States has arrived at the state it is in internationally, and what the future holds for the two global giants of India and China on the horizon. 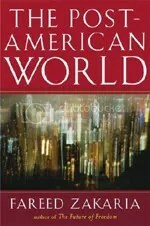 Zakaria begins by discussing how the United States – as well as its citizens – has continued to perceive itself, from the end of the Cold War to the present, as the sole global superpower and utopian democratic and capitalist nation by which the rest of the world should admire and follow suit with. This is all too clear with the globalization of numerous American companies such as the McDonald’s and Starbucks franchises, which can now be found almost anywhere in the world, on every continent except Antarctica. But in that time, the United States has lost uncountable jobs, manufacturing industries, and development institutions to other countries, which is now causing serious problems with unemployment and the cost of goods and services to the nation and its citizens. Coupled with this is the continued downfall and disinterest the rest of the world now has in the United States with the choices and decisions it has made. “The world is moving from anger to indifference, from anti-Americanism to post-Americanism,” Zakaria says. And it is not until the United States fully comprehends this, that things will begin turning around and improving. With the United States left in the wake of globalization, Zakaria turns the reader to the next two giants that will become the next so-called superpowers due to the variety and number of industries already situated within their borders, as well as the exploding workforce that is available at a much cheaper rate than the Western World. Zakaria spends most of the book, with specific chapters each on India and China, giving their history and development over the centuries and how it is that they now stand at this brink to become the next superpowers. He also offers sobering statistics in a world that is becoming more environmentally inclined: “Between 2006 and 2012, China and India will build eight hundred new coal-fired power plants – with combined [carbon dioxide] emissions five times the total savings of the Kyoto accords.” And yet the growth in these countries is unstoppable and how is America to critique this when it is one of the largest contributors of carbon dioxide in the world? Originally written on June 20th 2008 ©Alex C. Telander. Thomas Friedman is a well known columnist for the New York Times and the person to turn to for answers about this country’s economy and where it’s headed. The premiere hardcover edition of The World is Flat hit the bookshelves in April of 2006, and in that time it has gone through a second edition in hardcover, and finally a third edition in both paperback and hardcover. Friedman’s excuse for updating is that the world is constantly changing, necessitating further chapters in his book. One wonders if there may be a “Release 4.0” in the paperback; only time and our ever-changing present will tell. Nevertheless, The World is Flat is a truly unique book, whether it be for a student of economics, or a person looking for answers to why outsourcing is getting so out of control. 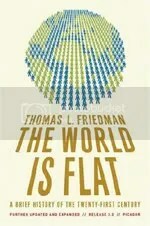 Friedman begins with an introduction to how he discovered that the world had become flat; noticing details here and there in his travels around the world, and then putting it all together. He then leads into his ten forces that flattened the world, explaining how they came to be, what effect they had on the “flattening” of the world, and how some are continuing to do so. These include two important dates: 11/9/89, which was when the Berlin Wall came down and eastern Europe and Russia joined the rest of the world once again; and 8/9/95 when Netscape first released its browser to computer owners, allowing them to surf this new thing called the Internet. Friedman hits every important step in the way business has changed in the last three decades: from Wal-Mart’s ingenuity in supply-chaining, leading to the incredible system whereby a product is purchased at a Wal-Mart store sending a message to the supplier which immediately starts making another copy of that product; to software development in its original free form with LINUX; to the light speed development of sites like MySpace, Facebook, and online blogs where everyone has a voice; to the existence of large buildings in places like Bangalore, India, housing thousands of customer service representatives helping American customers thousands of miles away with anything from credit card bills to cellphone technical questions. With these ten factors serving as a basis for how and why the world has become flattened, Friedman takes the reader on a trip around the world, elucidating exactly why when we call for help now, the chances of getting a person with an accent who’s native language isn’t English are incredibly high. But isn’t this what America is all about? Perhaps not, when the person you are talking to is on the other side of the world, and that this is somehow cheaper and better for the company you are calling that using an American citizen who could be just a few miles away. While Friedman does have some answers, it is clear that America and the world is at a turning point, much like the beginning of the twentieth century when there was the roaring beast of industrialization, and the explosion of the assembly-line system of the Model T Ford. One can certainly expect more from Friedman in the coming years, as new and inconceivable changes happen before our very eyes. 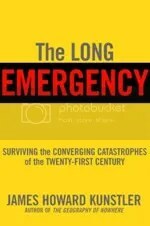 For now, The World is Flat is the only guidebook we have, and it does its job to a T.
The Long Emergency is an eye-catching book with its bright alarm-yellow cover and black and red title. It’s a book about the future of the world, what’s going to happen when we run out of oil, and what to do when this “Long Emergency” begins. The first part of the book goes into depth about when oil was discovered, how it was first used, when and how it was converted into the many products that use oil today. The reader learns what are the events that led up to the discovery of oil in the Middle East and the reason it is in its horrible state today. After this enlightening history lesson, Kunstler goes on to explain that there is a specific oil production peak that will be reached, when half of the available oil in the world has been used up, and the other half — which is harder to get — will drive up gas and oil prices. According to a number of sources in the footnotes, this peak will be reached some time between the year 2000 and 2008. Kunstler says that the way we will be able to tell is through the oscillation of oil prices rising greatly, then dropping a little, then raising more, but only going down a little each time. Over the past year, this is exactly what has happened, and I’m pretty sure we’re never going to see gas go below $2 again. Kunstler goes on to point out that the supposed alternative forms of energy we’re working on will be nowhere near to replacing the oil industry once we dispense with it. This is mainly due to the recent Republican Presidents, starting with Reagan who stopped most funding of alternative energy means and essentially killed the drive for it. Along with Bush Senior and our current idiot, they are all part of a white male arrogant group that believes we will never run out of oil, and it is merely a case of finding it in the earth, albeit by digging deeper and further (re: Alaska! ); coupled with this is these men’s beliefs that the Rapture will arrive tomorrow and they’ll be ascending to Heaven, leaving all their problems behind them. Though Clinton is also to blame for not looking towards the future and working on preparing the civilized world for the inevitable. Kunstler predicts all out pandemonium and chaos, worst felt in the United States, of course, where suburbia is in full force. When all the material goods and services we’ve taken for granted for so long collapse, and our society crashes around us, the Long Emergency will being. This is what Kunstler says. Though he provides little advice and assurance in how one can survive this event. Plus there’s the fact that this nonfiction work doesn’t have an index or bibliography at the end. I know all nonfiction works don’t need this, but when it’s a book predicting everything going to hell in my lifetime, I would at least like a list for further readings, or maybe some suggested websites. Originally written on May 20th 2005 ©Alex C. Telander.